Have you ever considered why a car journey feels shorter on the return leg? It's because the brain needs variation. Change is critical. During the first leg, your mind is digesting the road and its surroundings. It's kept active by processing new information. On the way back, it's already familiar with all journey aspects. According to populist life coaches, this is why variation in life is so important. An eternal routine could make it seem like your entire existence goes by in a flash. A break from that, even if a tedious or unenjoyable break, is paramount. 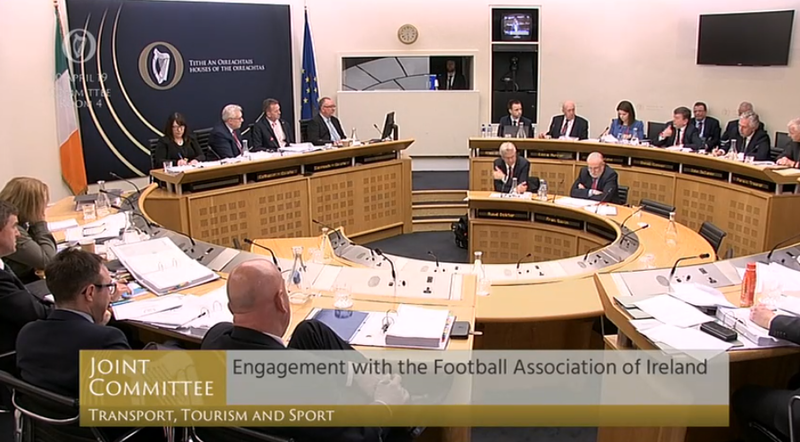 This is the one silver lining for those who choose to spend their Wednesday watching John Delaney and members of the FAI board appear before the Oireachtas Committee for Tourism, Transport and Sport. It certainly proved that variation theory, this mild Spring day watching proceedings in Committee Room 4 at Leinster House felt like a lifetime. It began with a whimper. President Donal Conway was to make his opening statement, with former CEO John Delaney to follow. However, the committee did not have a copy of the FAI's new Executive Vice-President's statement as it was not submitted beforehand. Therefore we had to adjourn so it could be circulated, and then adjourn some more so everyone could read it. "On legal advice, I am prevented from making any further comment in relation to the finances of the Association or my former role as CEO or the €100,000 payment either directly or indirectly,” said Delaney. The Sunday Times had reported on a €100,000 bridging loan which Delaney provided to the FAI in 2017. Last weekend, they followed it with a report that the FAI still had not confirmed who would voluntarily attend today's proceedings to answer questions. They got their answer, hell hath no fury like an administrator scorned. This appearance was initially scheduled for January. Then it was postponed until 20 February, only to be postponed again. Finally, Delaney and his delegation delivered. Present and content. Questions about loans or activities went unanswered. This was always going to be on his terms. Independent TD Catherine Murphy lobbed in the first tennis ball, asking about the former CEO's communication with the loan. The former CEO loosened the grip of his pen and with a swift backhand returned serve. "I’ve made it clear from my statement that on legal advice, I can’t add anything to what I’ve said." Fianna Fail TD Robert Troy followed it up, asking were some aspects of the association more equal than others. Why hadn't the FAI helped the League of Ireland club which neared collapse last season? Troy: "Last year, Bray Wanderers, a historical club, nearly went to its knees?" Troy: "No. That was to Mr. Delaney." Conway: "Well can I take this one, please?" Then the chairman and Fine Gael TD Fergus O'Dowd interrupted to say Delaney can answer, but Conway not for convincing. "He said questions in relation to his former role as CEO, which that would come under, in his statement, he said he did not wish to take those questions." Instead, Conway continued to carry the brunt. TD Ruth Coppinger had been awaiting this opportunity for a long time and it showed. During the first half, she asked should the FAI president have asked Delaney to step down pending an investigation of everything. She then tried to ask about his salary in relation to the League of Ireland prize money, but the query was cut off as the chair declared it was not in their remit. Sinn Fein TD Imelda Munster cut a foiled figure. As the day rolled on, she let John Delaney know her feelings in no uncertain terms. "The Former CEO has behaved disgracefully today" she declared. "The only good thing is that the public out there have witnessed it." This got to the nub of the proceeding's fatal flaw. 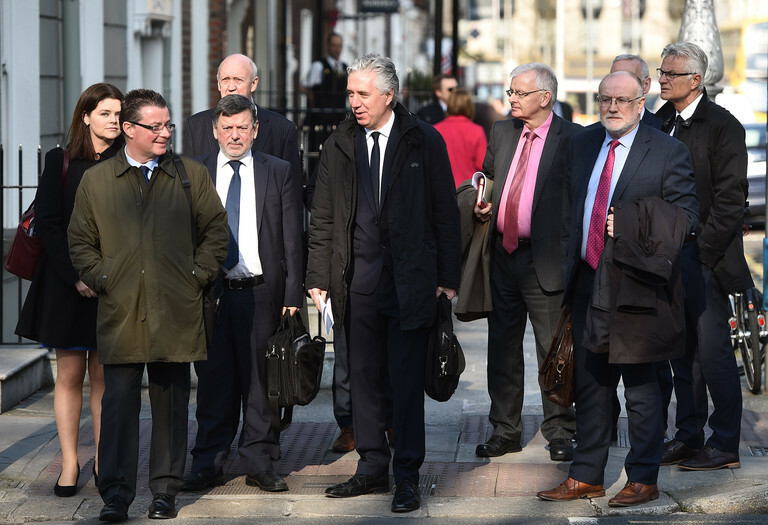 The FAI were present on a voluntary basis, as they keenly pointed out. Pandering to pressure while pleasing hardly anyone, bar one notable exception. 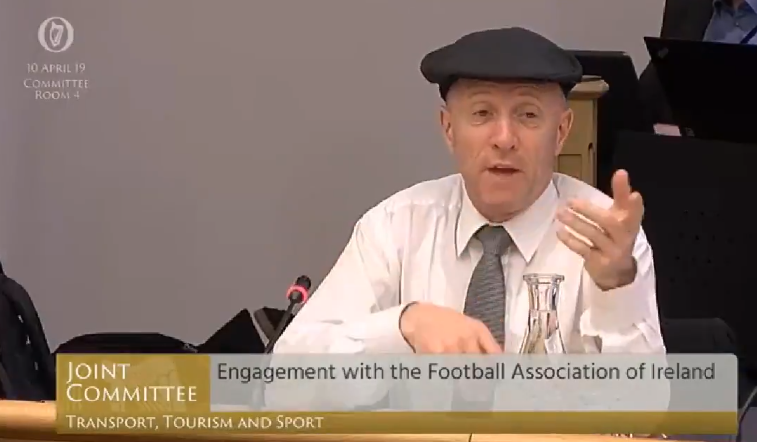 Michael Healy-Rae reserved his own contribution to hail all that is good about John Delaney. The self-styled champion of the common man had come to bat for the executive. "When it comes to accountancy practises, many of us in business have to do certain things at certain times." Herein lies the problem. A business is self-serving, the FAI is charged with governing the most popular sport in the country. The fact that Healy-Rae cannot differentiate between the two is telling. There were important business questions asked, but like Healy-Rae's soliloquy, they were met with no answer. Sinn Fein's Jonathan O'Brien tried to query if UEFA money earmarked for League of Ireland clubs was being used to solve the association's cash flow issues. Donal Conway responded to say it was "not something I'm comfortable with (discussing)". At FAI AGMs, there are no questions. So they don't answer to members and they are under no obligation to answer to elected state representatives. Who'll police the police? Not the Oireachtas committee anyway. A long journey that ended at an unfulfilling destination. Change is so important, or so we're told. Today's proceedings demonstrated it more than ever.